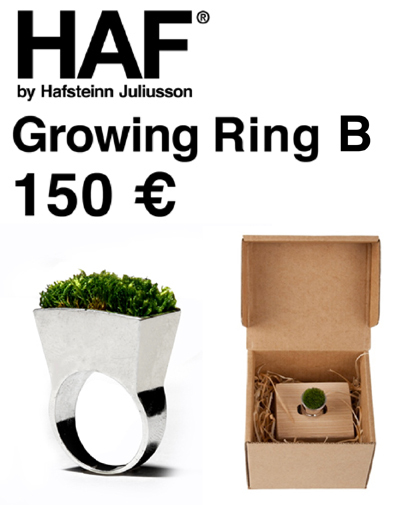 Green is always in but this new jewelry line from the Iceland designers, HAF takes this 'growing' trend to a new level. HAF by Hafstein Julliusson has necklaces that literally grow grass. Think Cha cha chia pet but in a modern ,wearable way. The moss stays up to 8 months and suggests watering it every 5 days. Rings come in different sizes or your choice of a necklace on a metal chain. If you are looking for a statement piece of jewelry, this is your own city park around your neck. Now let your inner green grow!